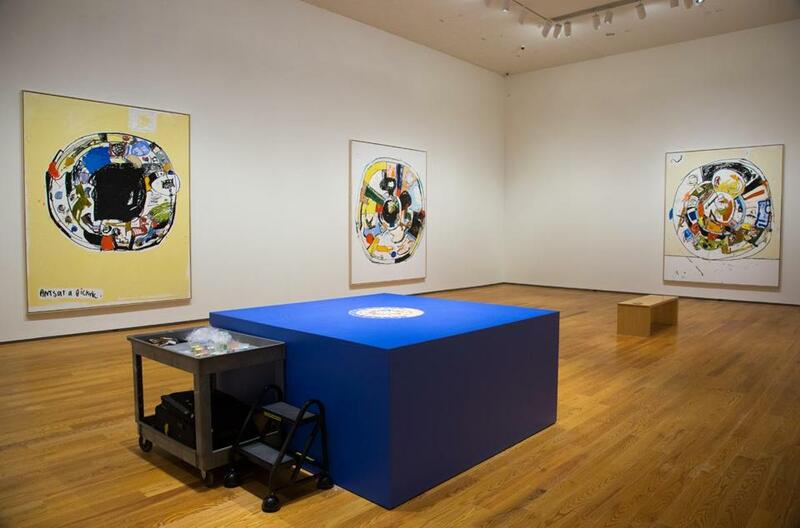 A view of the installation “Eddie Martinez: Ants at a Picknic” at the Davis Museum at Wellesley College. The group had already tried to recognize something, anything, in Martinez’s black and white “Mandala #5 (Untitled),” and found a banjo, a piano, a fetus, and more. The artist has specialized in cartoonist figuration in the past, but the imagery in his mandalas is harder to peg. Martinez plays in the territory between representation and abstraction where the brain tantalizingly teeters on a precipice of recognition. So does Joe Bradley, in his self-titled survey at the Rose Art Museum at Brandeis University, up through Jan. 28. The two painters had their first solo shows at Allston Skirt Gallery, in Boston, in the 2000s, and now work in New York and have international careers. Bradley was born in 1975, in Maine, and Martinez, in Connecticut, in 1977. They have exhibited together. But Martinez’s paintings are frantic, busy, and googly-eyed, tight coils at the moment of springing, and Bradley’s are slow and penetrating. Both have drawings and sculptures on view, but let’s not mistake these two for anything but painters. They contend explicitly with the modernists who laid the ground rules for abstraction, and work to break those rules, to make something new. Bradley’s show hypes his extraordinary pivots, from crisp, vinyl modular paintings to simple hieroglyphs to unstretched canvases mashed with paint and sullied with grime. Always, even the wall of jaunty drawings that greets the visitor, Bradley’s art confronts. His early modular paintings, such as “The Fisherman’s Friend,” wittily turn several canvases into components of a boxy figure. With the grease-pencil glyphs in the “Schmagoo” series, which came next, he raised the scratch marks of drawing to painting’s loftier standards. A Superman medallion and an ichthys, or fish symbol, inside a fanged mouth are as simple as a child’s drawing, spare yet big and emblematic. These initial paintings signify. They wink at the catalog of art historical meaning from which they draw. The “Schmagoo” paintings whistle to Picasso, Jean Dubuffet, and the elemental quality of cave paintings. In the next pieces, messy with paint, Bradley wars with abstraction’s hifalutin, hermetic quality using lowbrow weaponry — a taste for Underground Comix. You can glimpse the aggressive stride of R. Crumb’s “Keep on Truckin’” cartoon in “Drac,” powder-blue and brown on a scuffed-up drop cloth. The charmingly abrasive “All Duck” sets tangy yellows and tangled browns around a wide-open angle like the bill of an angry fowl. These paintings are denser, meatier, and less determinate than the early ones — less about something, and, thrillingly, more about themselves. Nothing is precious to this artist. He paints on unstretched canvas laid out on the floor. He walks over the paintings, leaving footprints. He sometimes stitches two or more together — as in “Love Boat,” named for the television show. It’s part grid painting, part quilt, part cheeky pantheon of influences — Lichtenstein benday dots, a Gottlieb burst, blue waves for the show’s logo, and one quadrant completely whited out, as if redacted. Is there something Bradley doesn’t want us to see? That may be. The large-scale “Sculpture for Bill Hand,” a 6-foot-tall, 8-foot-wide aluminum box painted pink, seems designed as much to block a view as to be looked at. And then there are the newest paintings, such as “Good World,” in which Bradley sets dense, worked-over passages of paint — geometric, like the modular paintings, except now it’s messier where the colors meet, and flecked, creased, and full of character. Bradley has painted both sides of this canvas; he chose which side to show. A stray flap of bare canvas folds over at the top left, teasing. The painting is more than the image, as modernism taught us, but it’s more than the object, too. There’s more to it, something private and hidden. A psychology lab? You bet. Martinez’s mandalas are taut with energy; they jingle-jangle and threaten to roll away. They are bold paintings. But they come across as the product of a strategy, where Bradley’s approach is to pull the rug out from under himself (after dirtying it with footprints). To be fair, it’s easier to see an artist blossom in the context of a survey show. Here the focus is on one series. Mandalas are spiritual symbols, a picture of the complex patterns within the circle of life. To contemplate Martinez’s mandalas is not a calming occupation. He pushes them beyond symbol into a realm still resonant but less predictable. They will not ground you. They will set you spinning — and that’s good. He could do well to push them even further.